11:35:00 |    12:00:00   |    #VALUE! In the 3rd column, I have a formula that calculates the difference in decimal number. 1st row works - can I make it work with the 2nd row without splitting the cell? Error Function MINUS parameter 1 expects number values. But '10:30:00 12:00:00' is text and cannot be coerced to a number. 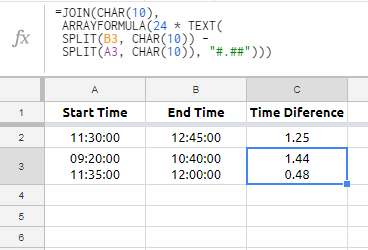 The formula is =(D26-C26)*24, where C26 and D26 are formatted as time, E column is formatted as a number. Here char(10) is the "new line" control character. Remark. Putting two values in one cell is generally a bad idea if you plan to continue calculating with them. It's mostly a thing we do with text or with final output.